- Commitment to leading and providing for their families. Become a sponsor - change a child's future! Sign up today! Catalina was first sponsored when she was four years old. An incredible little girl, she was first discovered by Elena, the local director of Children of Promise, when she was just twenty-seven days old. 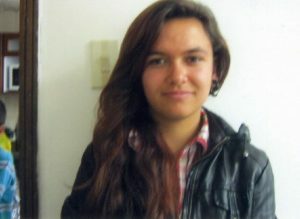 One day, Elena had stopped to talk to a woman begging in the streets of Bogota, Colombia. She was holding a bundle in her arm, her month-old baby, Catalina. Elena began a friendship with the young mother and discovered that she, her husband, and Catalina were living in a large pipe connected to the city's sewer system. Because Elena was a Christian she decided to act! She convinced a friend to rent a small room to the family in an office building and the church began to pray for them and love them. After being sponsored through Children of Promise, Catalina's mother passed away. She and her father are active in the church. Her father has struggled to earn enough to take care of his family. He is amazed with the Christians who have helped them so much because of their love of God. He is deeply thankful for the sponsor who has helped Catalina. "He has a sore, and he's had it for some time." "How long is some time?" we asked. Our mouths dropped open. "Where is this sore?" We slowly peeled Maung Lin's shirt from his left arm and side. Located slightly below his arm was an open, oozing wound which had been partially covered with limp cotton balls. "What is this from? Has he been seen by a doctor? Does it hurt?" The pastor sighed. "He's had it since he had tuberculosis. He saw a doctor at that time. But the family has no money, so they treat it at home the best they can. Yes, it hurts-he can't raise his arm or use it." Little Maung Ling couldn't understand our conversation, but his dark black eyes followed our every move. We gave thanks that he was sponsored; now we could use Emergency Fund money to help him. That day, the pastor took him to a special clinic, and we learned that surgery was required. Arrangements were quickly made. Later that afternoon, we found out a bit more about Maung Lin's family. The family has been Buddhist; they only recently became Christian. One thing that drew them to the Lord was the love and care they had seen the Church of God people extend to others. After they were saved, they had prayed for help with Maung Lin's wound. 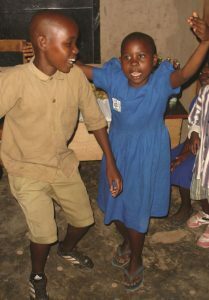 When they found out that his surgery would be paid for by the Children of Promise Emergency Fund, they were overcome. They fell to their knees in gratitude, thanking the God they had only recently come to know. 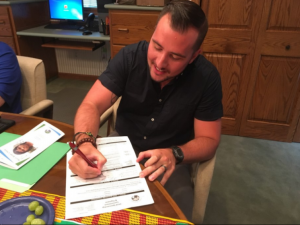 Kyle Hayes, Outreach Pastor, traveled with Dr. Paul Maxfield, Executive Director of Children of Promise, on a trip to Myanmar to see the work of Children of Promise for himself. After coming back from Asia, Kyle led Salem Church in hosting a Children of Promise Sunday. 62 new children were sponsored in one day. There now are 143 children sponsored within Salem Church. Salem Church of God has a dramatic worldwide ministry that impacts individual children’s lives daily, and could change the histories of the countries through whom these children are becoming. HOPE - Children with a new hope for the future, a new trajectory in life. POWER OF EDUCATION - The value of education that provides a chance to break the cycle of poverty. NEXT GENERATION LEADERSHIP - He specifically saw the impact Children of Promise is having on the church. Many graduates of Children of Promise are now active in leadership in their churches. They are the next generation of trained and educated Christian leaders who are making a difference in the lives of many others. Children of Promise is a partnership. You too, can make an impact with this world-wide team. Contact us to see how you can join the IMPACT team. Excitement was running high when we first received applications from Rwanda back in 2005. 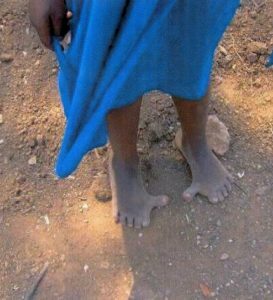 As we looked through the photos of these new children, someone said “Hey, this little girl has six toes on each foot!” Sure enough, barefoot little Tuyisenge had an extra toe sticking out on the side of each foot. 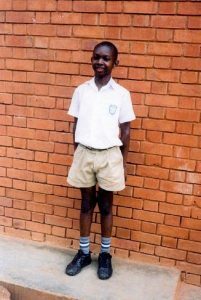 We soon learned that Tuyisenge (who was 9 at the time) had never been able to wear shoes. Her daily wish was, “I just want to wear shoes like everyone else.” This broke our hearts. We asked our local program leader in Rwanda to find out how Children of Promise could help. We were so thrilled when later we learned that the toes could be removed and she could have normal feet. Before long we received a photo of Tuyisenge standing on her bandaged feet –each with five toes only. Her wish has now come true. When we visited her after her operation, she danced a traditional Rwandan dance for us, something she had never been able to do before. The entire church body was in smiles and tears watching her. The surgery had touched their hearts and faith, just as it had touched Tuyisenge’s feet. 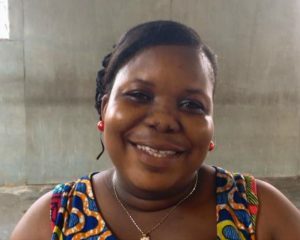 Juliet Odoi (Oh-doy) started school in nursery and began attending the Church of God church in her area in grade school. She was sponsored in 7thgrade and lived with both parents. In 7thgrade her father died. 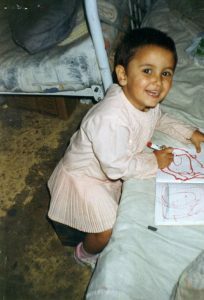 She would not have been able to attend school anymore, except a Children of Promise sponsor helped! Her mother could never have supported her schooling along with her four siblings. 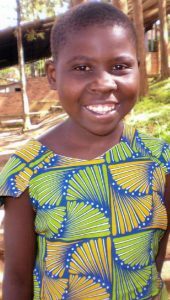 Juliet always liked school and learning and said she especially liked “the way the teachers handled the children, they are kind to the children.” She attended Amazing Grace School through 9thgrade, then she went to public high school for grades 10-12th. She was sponsored through all of it! Now, Juliet is teaching primary grade 3. She is attending a teachers training for 3 years, but thankfully she can teach and go to training college at the same time in Ghana. She met her husband, Eugene Odoi, at the school. 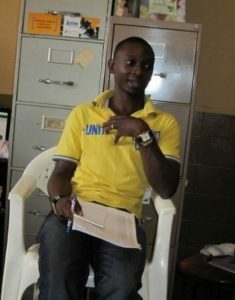 He is the head teacher and lead person on the Children of Promise committee. Juliet and Eugene were married in November 2015. Ronald Kizza’s (Keys –uh) father died while Ronald was very young. He and his brothers and sisters were raised by his mother until her death. Then they were given to an aunt to be raised. There simply wasn’t money for school fees, uniforms, or supplies. Food was scarce. He lived in a small two-room mud-brick hut. There was nothing he could do to make it better. Ronald was in the sixth grade when he first came into contact with Children of Promise. Ronald says he remembers the day he found out he had a sponsor to help him. He was excited to be able to go back to school. Ronald returned to Uganda working with the older sponsored children in Uganda, mentoring, guiding, and supporting them as they graduate and move on to the next stages of their lives. He is married and has a son. Danny Andrango is from the Children of Promise program in Ecuador. He grew up very poor. His family had very little money to meet their daily needs. A dear lady named Rhonda began to sponsor Danny one day through Children of Promise. Danny has said many times that her prayers and support gave him such strength. When Karen and Jon Lambert went to Ecuador as missionaries they asked the children what God wanted them to do with their lives. Because these poor children had no way to change their life they had no hopes or dreams. No one ever had an answer until Danny looked Karen right in the eye and said "God has called me to be a doctor." Danny was able to finish high school because of the support of Children of Promise. He then started planning his college education and testing to enter medical school. He studied for three months and then took the exam to see if he could enter the University Central's medical program. Not only did he get in, but he scored so high that he was allowed to skip pre-med and go directly into med school. 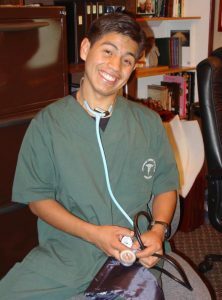 He eventually graduated and became the lead doctor at a hospital in the Amazon Jungle in the town of Taisha. 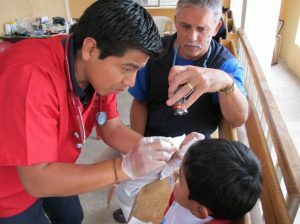 Danny has studied medicine in the U.S. as well and is a fully licensed doctor both in Ecuadorand the U.S. Dannyis highly respected as a doctor, and is thankful for what God has done through his sponsor. He often talks about Rhonda and how she and the Children of Promise program changed his life.